Five years ago, expert sea diver and Naval Captain Jonas Taylor encountered an unknown danger in the unexplored recesses of the Mariana Trench that forced him to abort his mission and abandon half his crew. Though the tragic incident earned him a dishonorable discharge, what ultimately cost him his career, his marriage and any semblance of honor was his unsupported and incredulous claims of what caused it – an attack on his vessel by a mammoth, 70-foot sea creature, believed to be extinct for more than a million years. But when a submersible lies sunk and disabled at the bottom of the ocean – carrying his ex-wife among the team onboard – he is the one who gets the call. Whether a shot at redemption or a suicide mission, Jonas must confront his fears and risk his own life and the lives of everyone trapped below on a single question: Could the Carcharodon Megalodon – the largest marine predator that ever existed – still be alive … and on the hunt? KIDS FIRST! 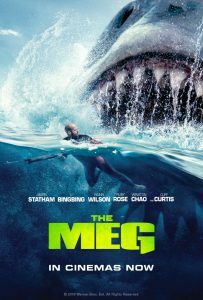 Film Critic Arjun N. comments, “The Meg is a somewhat entertaining homage to old-era shark flicks. A frightful direction and vibrant special effects provide a serviceable summer-end movie. Fans of shark flicks may want to check it out.” See his full review below. 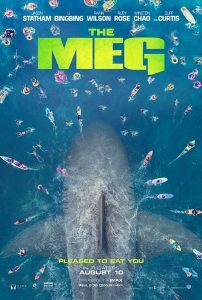 The Meg is a somewhat entertaining homage to old-era shark flicks. A frightful direction and vibrant special effects provide a serviceable summer-end movie. Fans of shark flicks may want to check it out. The movie follows a Shanghai-based, deep-sea team as they seek to postulate new discoveries among the underwater trenches. However, their discoveries go awry when a previously thought extinct Megalodon attacks their submersibles and threatens to roam the Shanghai seas. 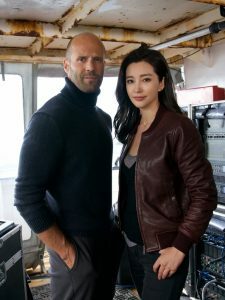 With time on the run, team leader Dr. Zhao (Winston Chao) recruits former rescue diver Jonas (Jason Statham). Unbeknownst to everyone, Jonas has previously encountered the same Megalodon and must now confront his fears to save those aboard. Jason Statham, as Jonas, is always a vibrant presence with his charm and smarm making gold of the cheesy script. He also excels in his underwater stunts, creating some nail-biting thrills. Bingbing Li, as Suyin, proves herself as a smart, yet impatient presence, who wants to prove herself. However, she does fall key to an unnecessary clichéd father-daughter subplot, but makes the best of what she is given. Winston Chao, as Dr. Zhang, greatly presents his fears and desperation for Suyin and the mission, in spite of the weak backing for the emotional stakes of the two. Rainn Wilson, as Jacks, heightens his stereotypical rich guy presence with well-timed remarks alike his in The Office. Shuya Sophia Cai, as Meiyang, is my favorite character in her banter with Statham and brave actions power her from just being a 8-year-old damsel in distress. She truly excels in her first, breakout role. Ruby Rose, Page Kennedy, and Cliff Curtis complete the rest of the pack, each giving a unique performance, even if the characters can be viewed as expendable at times. 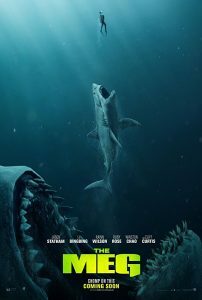 Jon Turteltaub’s direction allows for brisk thrills taking inspiration from Jaws, but allowing for his own unique takes on the genre. My favorite scene is the final act, as it goes all in with the illogic of the shark conflicts allowing for a fun conclusion. The other flaws are the inconsistency of the tone and writing of the movie, which goes from serious to knowingly funny at times and the placement of the scenes feels off at times. The movie also suffers by detracting from the shark conflict and focusing on poorly written character situations. In fact, it takes a long amount of occasionally grueling time and development for the Megalodon to even show up. The movie’s message is that being a hero can come with its fair share of compromises. I give this film 3 out of 5 stars and recommend it for ages 8 to 18, because of intense action, gore and some language. The movie releases in theaters on August 10, 2018 so check it out. This entry was posted on Friday, August 10th, 2018 at 4:43 pm and is filed under Feature Film Reviews. You can follow any responses to this entry through the RSS 2.0 feed. Both comments and pings are currently closed.